There are a lot of bonefish in Christmas Island, which you’ve probably heard. I found the bones of Xmas to be irrationally difficult, due in part to the weather (several days of that high cloud, diffused light that makes bonefish vanish on the white sand canvas) and in part to my inability to make it happen. Let me explain. There are loads of bones there. I saw maybe 200 a day, even if I got shots only at a fraction of those. In the low light the shots were really, really close. 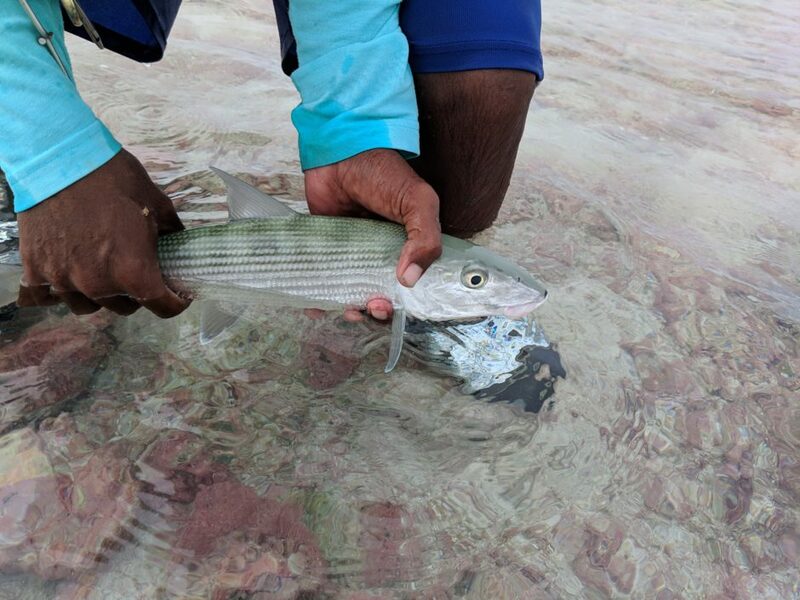 I hooked and caught bonefish with just the leader out of the rod, as well as at 10 feet and 20 feet and 30 feet and, rarely, maybe 40. However, I also botched a much higher percentage of fish in Xmas than I normally do and that comes down to the strip. The strip, for the lagoon bonefish, is much faster than anywhere else I’ve ever fished for bones. The bones are not picking the fly off the bottom, they are eating it as it swims. This may be because they are taking the fly not to be a shrimp, but as a milkfish fry (that’s Shane’s theory and it is as good as any I could come up with). If you are used to a short strip, pause, short strip, pause, or if you are used to a strip-and-sit kind of retrieve, this is going to be hard to adjust to. I certainly found it difficult to adapt to. On the ocean-side flats (the Korean Wreck) you may find a school of bones. I saw one of 30-40 fish, a school I took 3 fish out of. Inside the lagoon the bonefish just don’t seem to school up. If you see more than 3-4 fish together there is about a 90% chance those fish are actually milkfish. Milkfish can look frustratingly like bonefish and they share the same flats habitat. In deeper water the milks will be higher in the water column and the bones will be on the bottom, but in skinny water those fish can look very, very similar. When tailing, milks have a tail with some black on it, looking more like a permit tail than a bonefish, so that’s a giveaway. Don’t get me wrong… I caught bonefish, having one day with ~15 and there were so many other fish to go after. I had one day without a bonefish, but that was the milkfish day and my cup was pretty full with that experience, so I didn’t mind so much. The last day I had one particularly difficult morning, going 1/25 on legit shots. I was seeing the fish very well, but couldn’t make it happen. I don’t know what was wrong. That same time another angler in the group was going about 25/35… so, it wasn’t that people weren’t smashing it, it was just that I wasn’t smashing it. Maybe it was the wrong strip and maybe it was my fly selection. Maybe it was the UV flash that has a purple tinge to it that isn’t maybe what’s called for. Maybe I was just having a temporary mental block. I don’t know what my problem was, but I wasn’t firing on all cylinders. The bones of Xmas ran from 1-6 pounds with a few bigger fish around. I’d say they average 2-3 from what I saw. I’d tie differently for this trip, knowing what I do now. I never used a worm fly. I never used a green fly. I would have tied more plain Christmas Island Specials. I would have tied more orange Christmas Island Specials. I would have tied more #8s with small barbell eyes. I would have used regular crystal flash, not UV crystal flash. I’d add… my crabs were on point. I caught some nice bonefish and I had some decent bonefishing days. The days that were a bit more frustrating on bonefish were mitigated by other species (bluefin, GT, triggers, milkies). So… bones, bones, bones galore, but for me it proved difficult to break old habits to adapt a new mentality to fish for them. 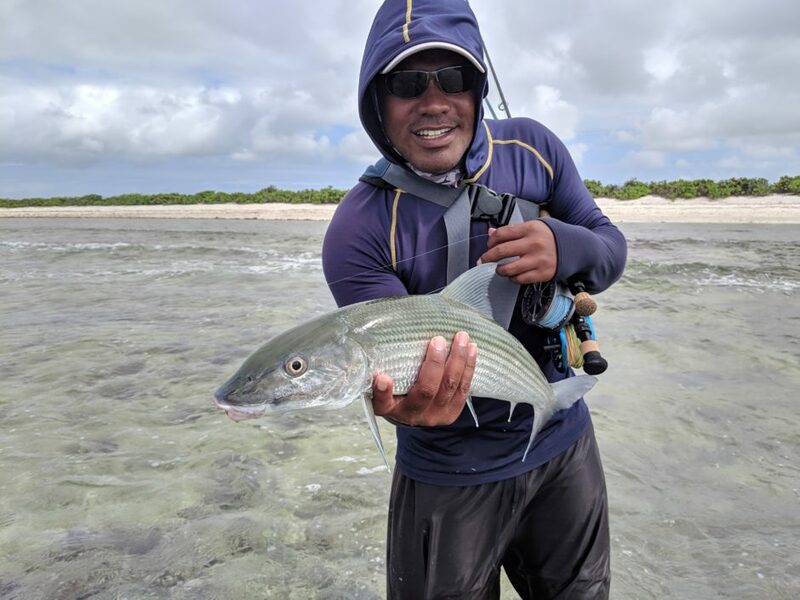 Many good bonefish days were had by those in our group, so my issues were not universal or signs of a “problem” with the fishing. Just had some of my own shortcomings exposed… but that’s what learning looks like and I’m not disappointed. This fly had the misfortune to find itself in the mouth of a trigger fish. Man… those chompers are serious. Guide Nick Denbow put me on this fish down out of Mahahaul, MX back in 2016. I found other triggers, hooked a few, but found them tough to get to hand and VERY tough on flies. I fished for an hour with one of those bitters crimped by a trigger before I noticed. 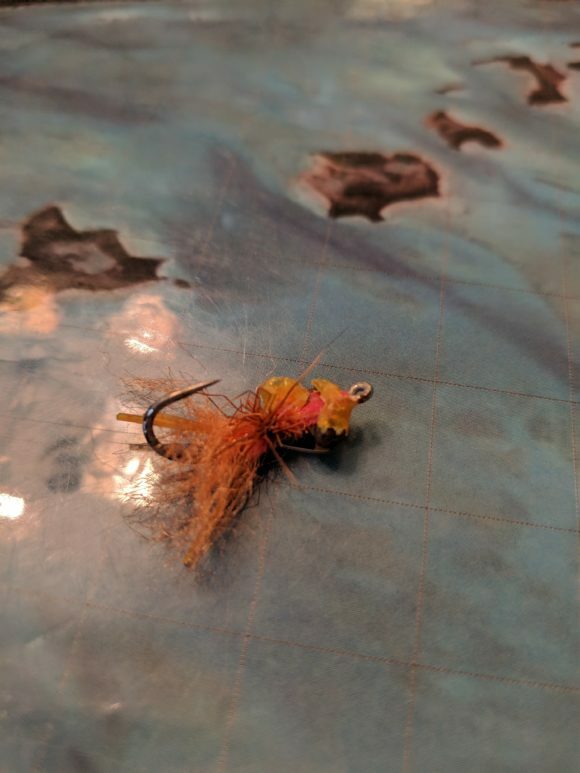 As I head to Christmas Island here in a few weeks I’m thinking about triggers again and I’m trying to tie up some flies durable enough to get the job done. I’m using epoxy (really for the first time) and I’m working on things crabby. I don’t even know what these hooks are. Found them at Bass Pro and not in the fly tying section. This is some kind of bait hook and about 4x heavier than any other fly hook that size I’ve ever seen. That’ll do… that’ll do. Look out triggers… I’m coming for you… wherever you are. Yeah… not professionally done, but, ya know… here’s a go. I love this fly. I end up tying it when I don’t know what else to tie. I have this fly in many, many sizes and variations. 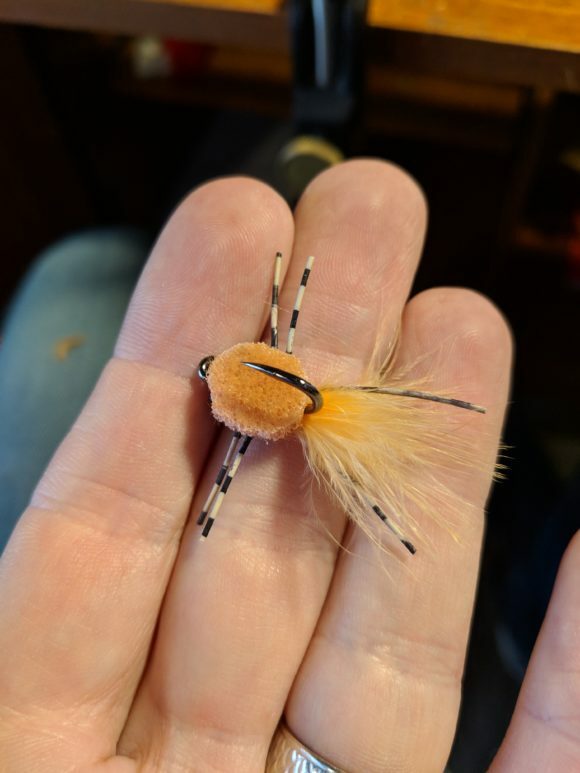 I usually start with this fly in some form and I’ll fish it all day if it is working at all. Seems like, maybe, I should have turned the phone over on its side? Hey, you like bonefish? You want to have the right flies? 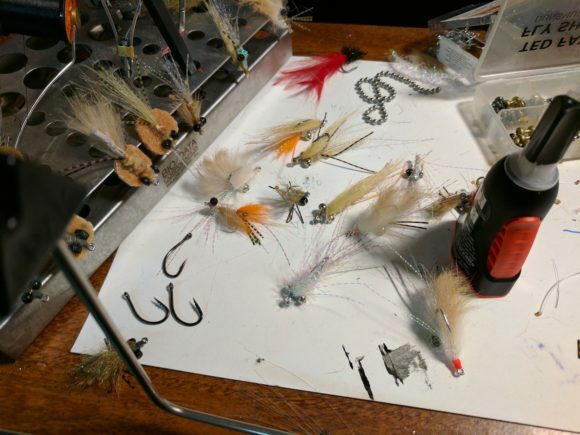 Check out the Gink & Gasoline post about, ya know, stocking your fly box for bonefish. The only thing I’d add to the list of pointers would be this. Have some flies without flash. It is another variable to take into consideration. Really, really pressured fish may not like any flash at all. If all your flies have flash, and I have some that are nothing BUT flash, they will high tail it as soon as your sparkle fly hits the water. A #6 with just the flash for a wing. Running out of ink in a favorite pen or running out of paper in a work journal is the manifestation of effort expended. It is evidence. Proof. So it is with a spool of thread at the tying desk. 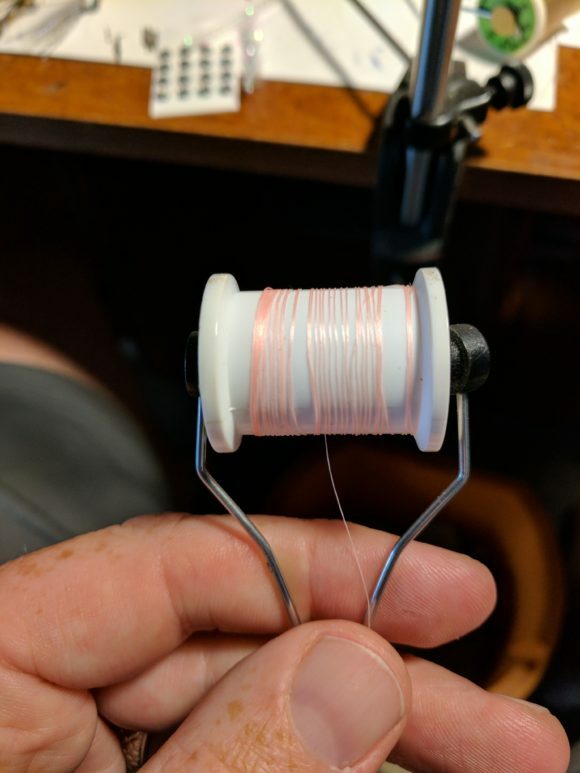 I like finishing spools of thread. I like running out of hooks and craft fur and crystal flash. I’m putting in the time. I am putting in the wraps. Not much left of this one. I forget just how much I enjoy sitting at the vice and pounding out some flies. My vice and tying table don’t live in the house. I’m relegated to the garage, but that means I can be a bit messier than my wife would allow inside, so it could be all for the best. The desk is something I’ve had for 13 years now. I used it as a computer desk at one point before I saw the obvious and converted it into my tying desk. I’ve gone through a few vices, even one that was sent to me by a reader of the blog. This vice works well. I’m not sure of the brand, as that has never been really important to me. I just need it to work and this works. 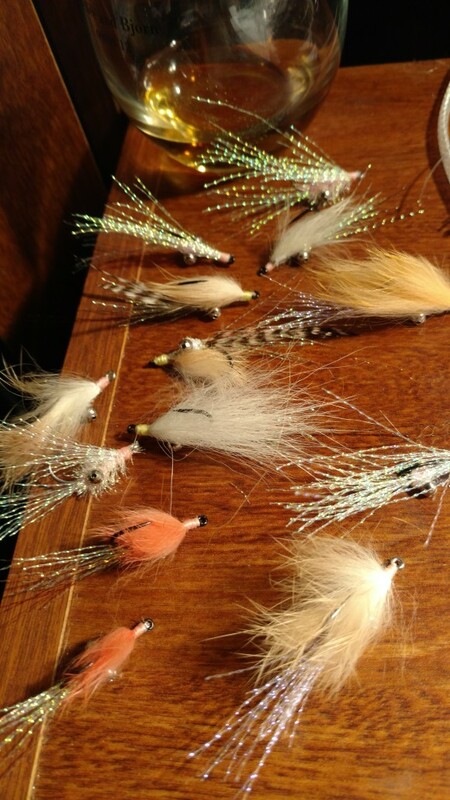 I’ve been tying for Mexico, which happens in about a week. 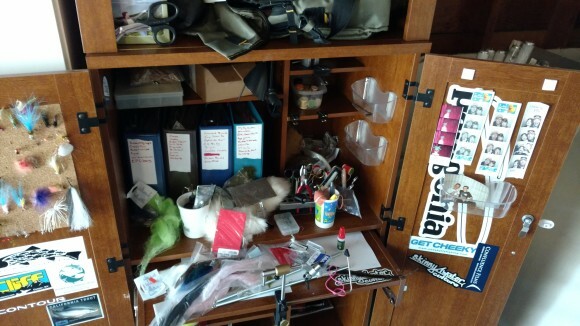 I need to go through my existing boxes and pull out flies that I know I won’t fish. Some flies have been sitting there for years and are rusty, others I have consistently bypassed for the past 5 years so should probably take out of the box in favor of something I might actually fish. I like tying. I like creating. I like sitting there in my garage and watching a fly take shape with a few wraps of thread and bits of fur. It is “crafting for dudes.” For those of you who still aren’t in to tying, I recommend it. It brings you just one step further into the game. Catching a fish on a fly you tied is pretty awesome. Here is what I’ve been tying up. All of these are new ties for Mexico and the box in general. Trying to bring some order to what I’m tying. Oh man… so many of these things need to be retired. So many more need to be tied. 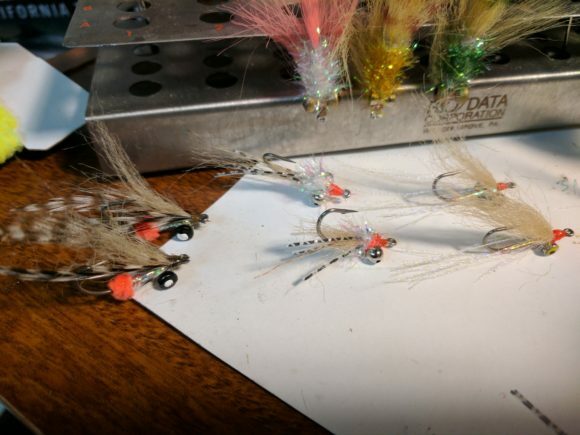 Maybe I don’t need to tie anything for Belize (I don’t, I’m sorted there), but for the Yucatan I’m going to need some different flies (like, flies with lead eyes, which I have found zero use for when casting to bonefish in 12 inches of non-tidal-action water). I dig my boxes. There’s some serious time invested in there. 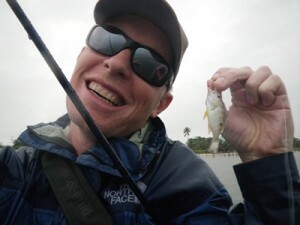 Belize… smallest fish of my 2010 trip. 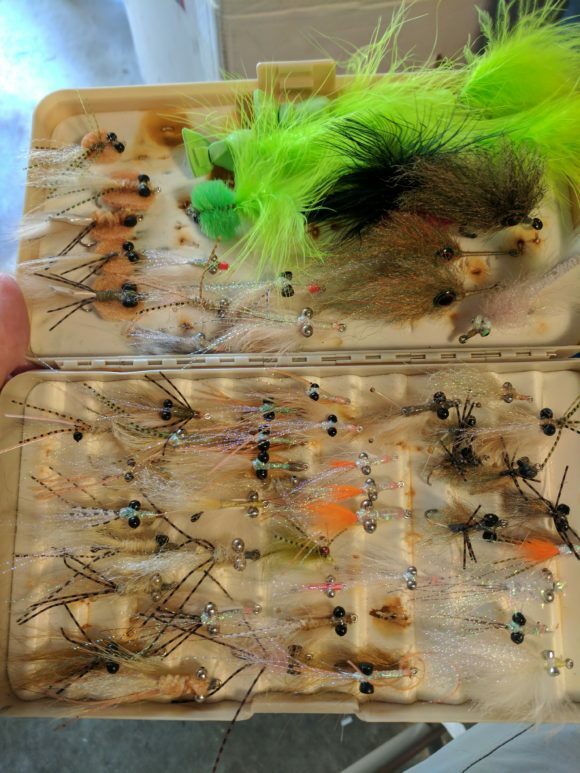 Belize, 88 days away, means I need to get back at the vice and it means different flies than I’d have in my box otherwise. 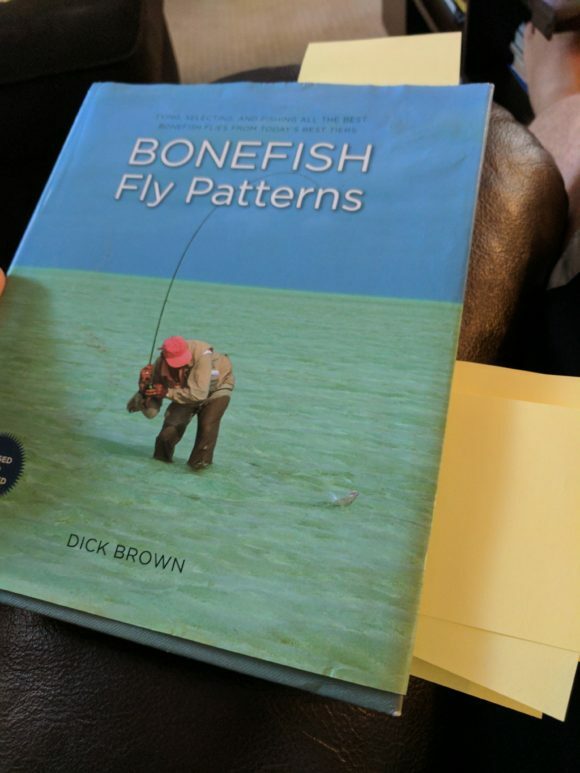 On the bonefish front, it means small flies. #6’s and #8’s… yes… #8’s. 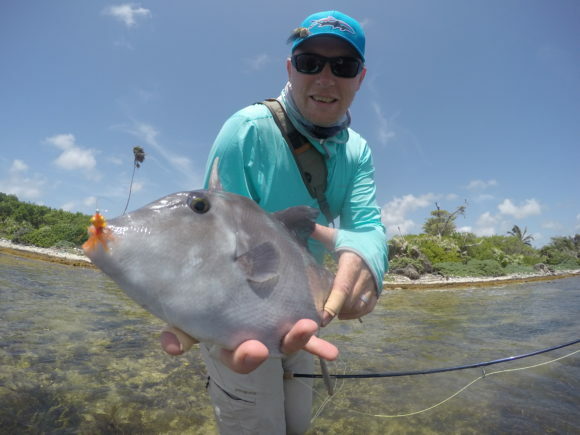 Not only smaller flies than you are likely to fish in the Bahamas, but also adding a weed-guard is a good idea. For tarpon… well… I do dig on the bunny flies and I could stand a few more lighter colored tarpon bunnies. I’ll likely ties some #1’s for any tarpon I might come across. 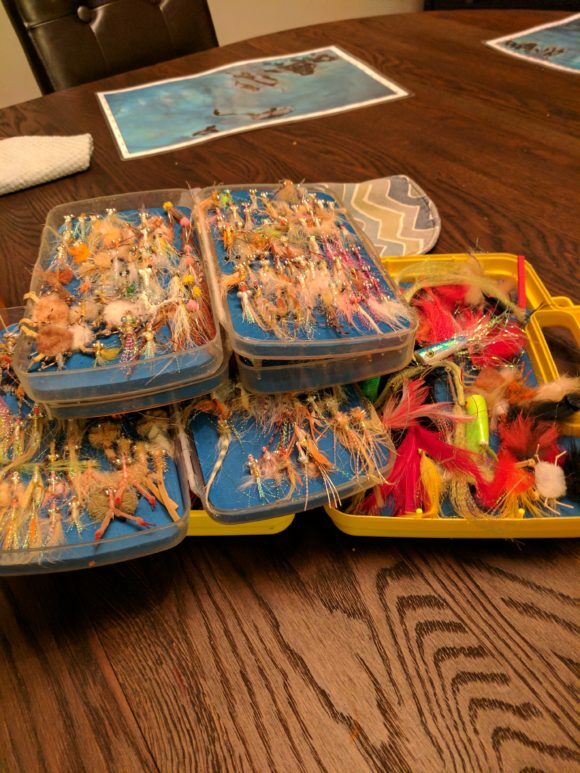 Now… this is a trip with my daughter and while our goal is for her to catch a bonefish on a fly (if we end up at a mud, don’t judge me), it is possible we need to throw some gear for fish as well. I’m never really too sure what spinning gear to bring along for maybe catching a bonefish. That isn’t what I’ve been doing. So, might need to seek out some consultation on that front. How much fly fishing I get to do is really a great unknown. The #1 priority is to keep the girl happy and have a good vacation. That certainly means I’ll fish less than I would like to fish, but there WILL be some fishing. We moved and in that process all my fly tying materials, even the desk itself, were packed up and carted the 2.7 miles from the first house to our new home (I’m never moving again). 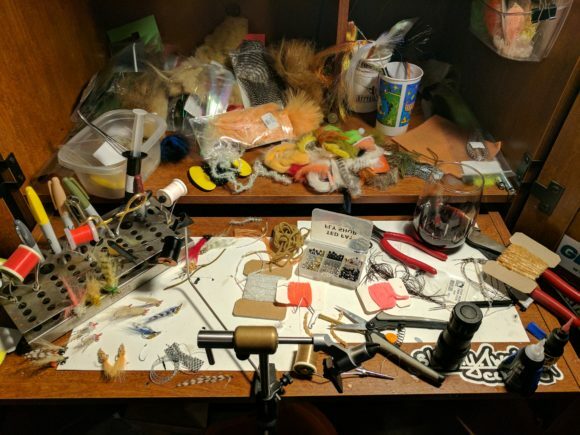 This was the sixth move for the fly tying desk in the past 9 years, but it is still with me. The new home didn’t have room for my desk, but the garage did have room and that’s where it ended up. It is a little cold in there, but this is California, so a little cold is just that and nothing a space heater couldn’t rectify. Now… now I have a trip on the books and speeding toward me like Christmas or my anniversary, close now and soon it will be right on top of me and I better get to planning and actually DOING stuff to get ready or I won’t be. So the boxes got unpacked and put away and I figured out how to get some power over to my little detached corner for the light and the heater and found a folding chair and now I’m back in business. It felt good to be back at the vice after a few months of not being there. It felt good to set up a little bit of tropical thinking in this little corner of suburbia. I tied flies for bonefish to reject, to flee and to crush, all of these outcomes are almost certain to happen, maybe even on the same cast. Two weeks and they are getting on a plane (on planes, plural) with me and flying across the country and then out of it and touching down in a place I don’t know well at all, but kind of love and know I will love for the rest of my days and I’m going to use those bits of metal and plastic and thread to carry out one of those imperatives of my soul, of my being, to look for the shadow on the sandy flat, the movement contrary to the chop or the current, the flash of a tail, the gray ghost in his stunning habitat. I think about that as I’m wrapping the bare hook in my garage with the space heater humming and a glass of not-very-good rum sitting mostly undrunk on my desk, getting in a Caribbean mindset. I think of what might look good to a bonefish. I think about movement and flash and what might tangle and how something might fish and the colors that might be intoxicating or repulsive to a creature with a brain the size of a pea and who will outsmart me more than I will outsmart it. And I tie. 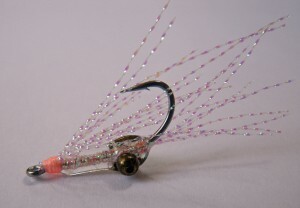 I tie each fly in its own way, creating what seems to be asking to be created. Whip finish and head cement and take out from the jaws of the vice and put it with its new fraternity and put the next blank canvas in the vice and think again of skinny water, casting decks and polarized lenses. The haul for the night. I know this has made the rounds, but damn… this is just the coolest thing I’ve seen in a long time. I love everything about this. Makes me think about getting that trip to Christmas on the books… 2017?